Fresh & Clean wins a contract to install defibrillators after an extremely rigorous tender process. 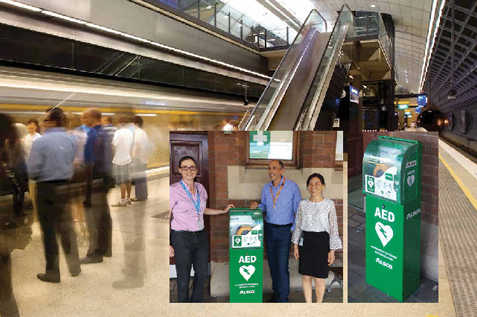 In late, 2016 Fresh & Clean was awarded the contract to install Alsco’s Automated External Defibrillators (AEDs) across the extensive Sydney Trains network. The rollout began in July, with Alsco’s AEDs now having been installed at around 95 locations across Australia. Central railway station, which currently has 900,000 people passing through it each day, has been allocated seven, with plans to install three more. Portable defibrillators are scheduled for deployment on 30 regional trains before Christmas. A sudden cardiac arrest is a leading cause of death in Australia. As response time is critical for survival, the use of an AED can increase the survival rate from five percent up 70 percent, if used within the first few minutes of the cardiac arrest. The Heartsine defibrillators available from Alsco offer the latest in defibrillator technology. The machines are fully automated with audio and visual cues that will guide even an untrained person through the steps necessary to save a life. The fantastic thing about our defibrillators is that they are incredibly easy to use and won’t operate unless somebody needs one. It’s a very simple and straightforward process. All that is needed to use an AED is the ability to recognise that someone who has collapsed may have had a sudden cardiac arrest. The unit then makes shock delivery decisions based on the victim’s heart rhythm and all events are recorded within the unit. The event can be downloaded and sent to medical professionals for assessment. The AIVIA enclosure has climate control technology that protects the AED unit from humidity, dust, wind, and rain. It is monitored 24/7, allowing us to check the status of the defibrillator and access any security camera photos. As soon as the cabinet is opened, an alarm is triggered, alerting Sydney Trains Security and Alsco staff remotely, while the security camera photographs the person accessing the AED. They are very clever units because of their transparency. ‘This is a fantastic community service provided by Sydney Trains, and the great news is that they have already saved lives,’ says Monique.